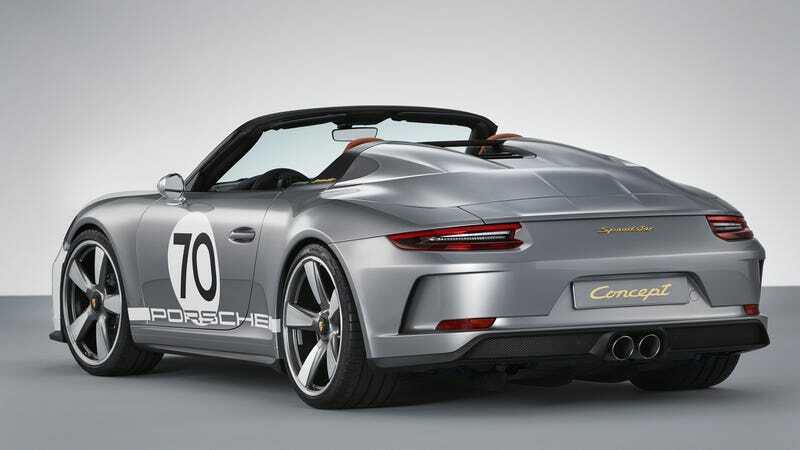 The Porsche 911 Speedster Concept, which we saw in June, was a lovely 70th birthday present Porsche gave itself to honor the design of the Porsche 356 Speedsters. The photos were awesome to look at on their own, but this deeper dive video was also extremely necessary. Luckily, our friends at Carfection have got us covered. While at this year’s Goodwood Festival of Speed, host Henry Catchpole got to chatting with Porsche GT boss Andreas Preuninger about the Speedster Concept. The concept, of course, is purely a 911 GT3 beneath its pretty skin. That means GT3 components, dampers, springs and manual transmission, with a 911 R engine. But as for unique Speedster touches, the beauty lies in the details. It has an appropriate color scheme, classic wheels, a center-mounted gas cap, 1960s-style mirrors and “taped” headlamps. I find this way better than any recent homages done by other carmakers, like Lamborghini. Did you see that Aventador Miura Homage? They literally just painted it differently. Boring! If you want to hear two dudes get really excited about a good Porsche, check out the rest of the video.